If you are a visitor to the vast and rugged state of Alaska, plan a unique ghost-hunting adventure and stay at one of Alaska's haunted hotels. And if you are a resident of Alaska, get to know your state's spookier side and embark on an exploration of the unexplainable and visit one of Alaska's very own haunted hotels. 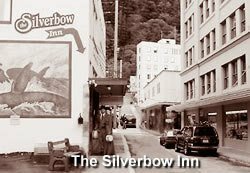 One of its most haunted hotel is the Historic Silverbow Hotel in Juneau that is home to a very friendly ghost named Gus. While enjoying a rustic, frontier-filled day of hiking and fishing, and it's time to settle down for the evening at The Historic Anchorage Hotel, don't be surprised by its long-time guests....ghosts! The oldest hotel in Anchorage, it's not surprising it has a haunted history. Several guests have reported seeing a ghostly young girl walk the second floor hall. Also rooms 215 and 217 the TV's will turn on and off at its own doing. As well, the water in the tub and sink will run by itself. Employees have reportedly heard people coming down the stairs when the hotel is empty, and few have seen a man walk past stairs. 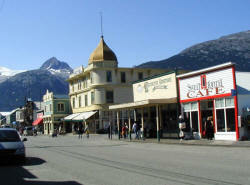 Located in the small and charming town of Skagway (Southeast Alaska), the Golden North Hotel is an old dame of a hotel. 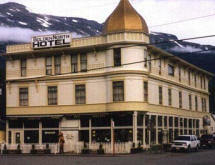 Built in 1898, The Golden North Hotel is the oldest operating hotel in Alaska. 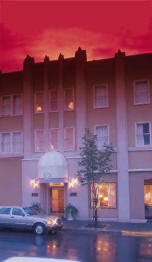 It was originally a two story hotel, it was then moved in 1908 by horse and capstan to its present location. A third story and the world famous golden dome were also added at this time. The Golden North is also known to house a small collection of ghosts. Apparently there exists two ghostly entities, one of them named Mary. 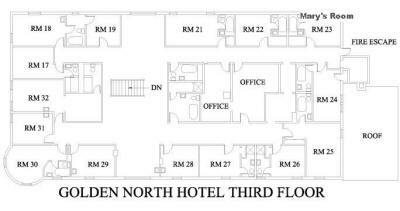 Mary seems to spend her time on the third floor in room 23 (left). The story surrounding Mary is she had caught pneumonia while waiting for her fiancé to return from a gold prospecting expedition. Unfortunately, Mary died from her illness in her room. Guests have witnessed images of her as well as experiencing choking sensations (perhaps pneumonia like?). The second ghostly activity seems to take place on the second floor in room 14. An orb or a strange “light” appears in the room at night. Its origination is unknown...for now. Today, you can stay in one of its 31 rooms, dedicated to gold rush families and filled with their mementos and antiques. The first floor offers a 60 seat pub, 80 seat Victorian style restaurant, 30 seat outdoor patio and Southeast Alaska’s first microbrewery. Hopefully (or not), you might get a chance to run into Mary or see the orb in room 14. 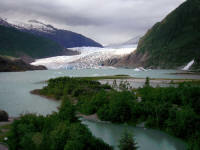 Located in the heart of downtown Juneau is the charming Historic Silverbow Inn. This eleven-roomed boutique hotel is also is known for its local bakery. If you're up early enough, ready to start the day exploring Juneau’s natural beauty, you might even get the chance to meet a friendly ghost. 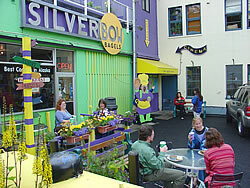 Housed within the popular Juneau’s Historic Silverbow Inn is their world-famous bakery, aptly named the Silverbow Bakery (left). Okay, it may not be world-famous but it does hold the distinction of being the oldest operating bakery in the State of Alaska. It also holds the distinction of being haunted by its founder, Gus Messerschmidt (below). In 1898, Messerschmidt immigrated to Alaska from Austria and opened a bakery, where he and his family lived in an apartment above the bakery. Gus died in 1938, but it is believed that he still hangs around his beloved bakery making himself known especially to the early risers. No worries though, the ghost is rumored to be a friendly presence.